Alex and I really wanted to focus on sustainability in our project. We think there is a lot of untapped potential in the desk arrangement, placement and scale of the crit space and its different components such as the collaborative table and the projection. Through our meeting with Mr. Aziz we would like to gain insight into the different ways in which we as students can monitor and track different types of energy consumption and, with this data, come up with new ways to make our practices in studio more sustainable. We are both very much on the same page with where we see this project going and it is exciting to see all of the potential that this space has. We are looking forward to learning new technical skills that will further enhance our presentation and concept. As of now, I think we need the meeting with Mr. Aziz to happen, and to gather information from that, in order for our project to move forward. 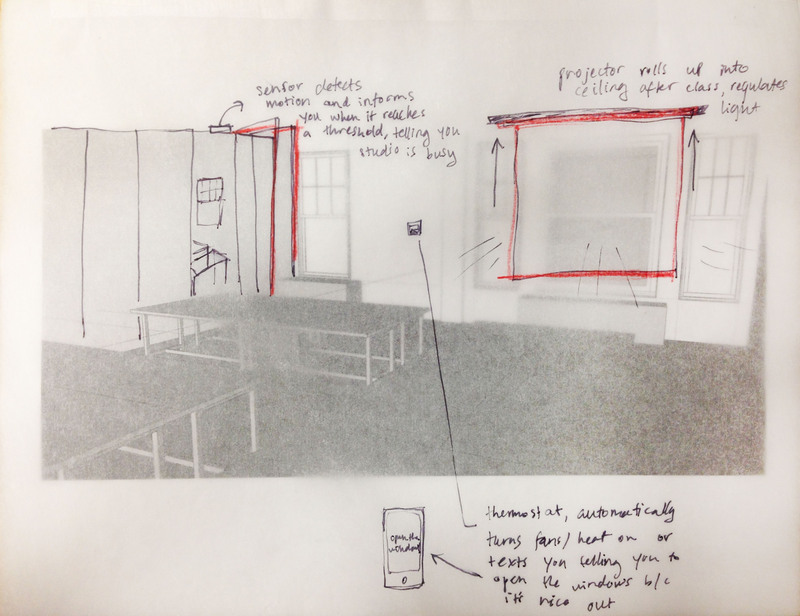 I think we view this project as a studio redesign as well as a way for us to modify behaviors of the room and its users so that the outputs are more sustainable. I really loved doing this project. It allowed me to meet people who were directly affected by the problem I was trying to deal with and who presented new problems to me that helped me to develop a stronger and more informed product. After listening to the critique on Tuesday, I really wanted to get in touch with the people who use and run the space. 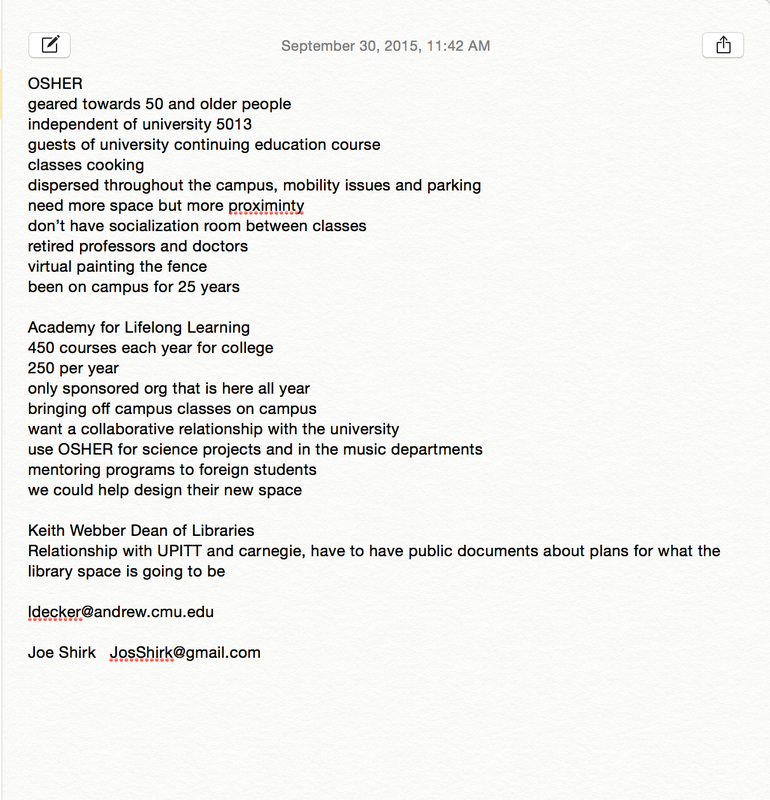 I emailed Gloriana St. Clair, thinking she was still the Dean of Libraries, however she informed me of the Osher group that uses library space and agreed to meet with me to discuss my plans for the physical and digital spaces. She and her fellow members of Osher had great insight and suggestions about the project and it got me thinking about how the library structure is completely temporary for certain areas and the information being put out into the world needs to inform people of this but still make them aware of the programs that exist here. 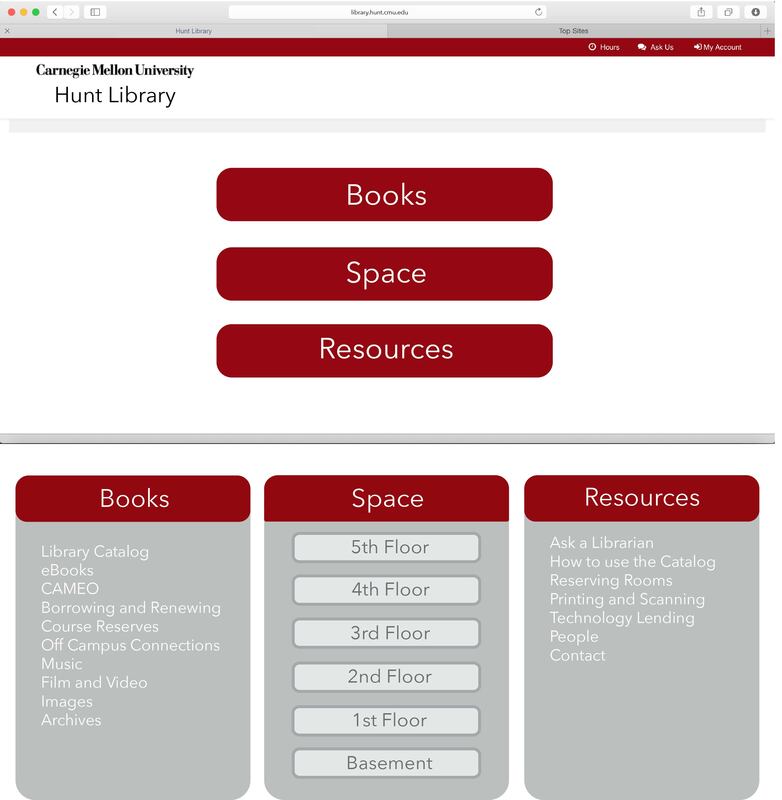 I tried to incorporate this new knowledge into my project by directly linking the different resources and websites to the Hunt Library website while still making people aware of the fact that certain things in the library are temporary and will eventually move a new space. I incorporated all the important elements of the library and its resources into the new Hunt Library website. Something I wish I had done is change around the layout of each floor of the library and diagram it so that the actual space makes more sense. Hunt’s layout is incredibly counterintuitive and doesn’t make much sense. There are also great resources that very few people know about and take advantage of so I wanted to make these resources more apparent by putting them all in one space that’s easy to understand. For this project I chose to explore the various possibilities of what we can do with the Smartthings app rather than what can we do if we connect Smartthings in IFTTT. 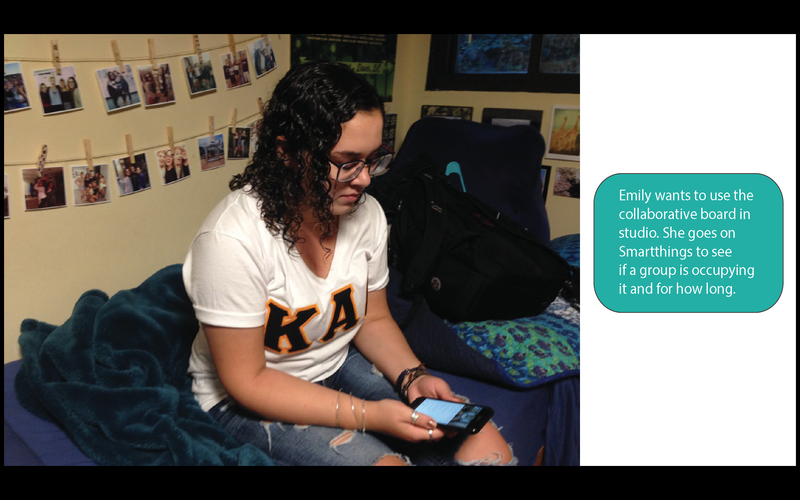 Many students in the environments studio, over the past couple of days, have been complaining about the quantity of notifications one receives on their phone after linking the devices in the room to it. 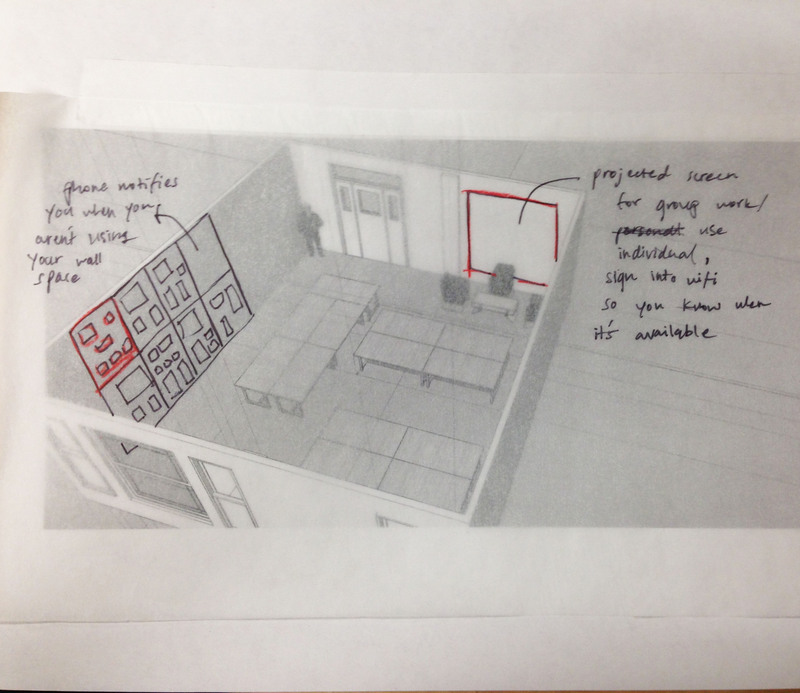 For my exploration I chose to describe a scenario in which a student in environments wants to see if the newly added collaboration area in studio is being occupied. The student is far away from studio and doesn’t want to go in just to find out whether the space is being occupied. Through the Smartthings app the student can see if any devices are connected, view a schedule of who is planning on using the space, or sync their own device remotely if they are running late for a group meeting and want to share their work ahead of time. I believe that talking in small groups about student work is one of the most effective ways to develop your ideas so I really wanted to incorporate an interactive board, or a Promethian board, into our design space. 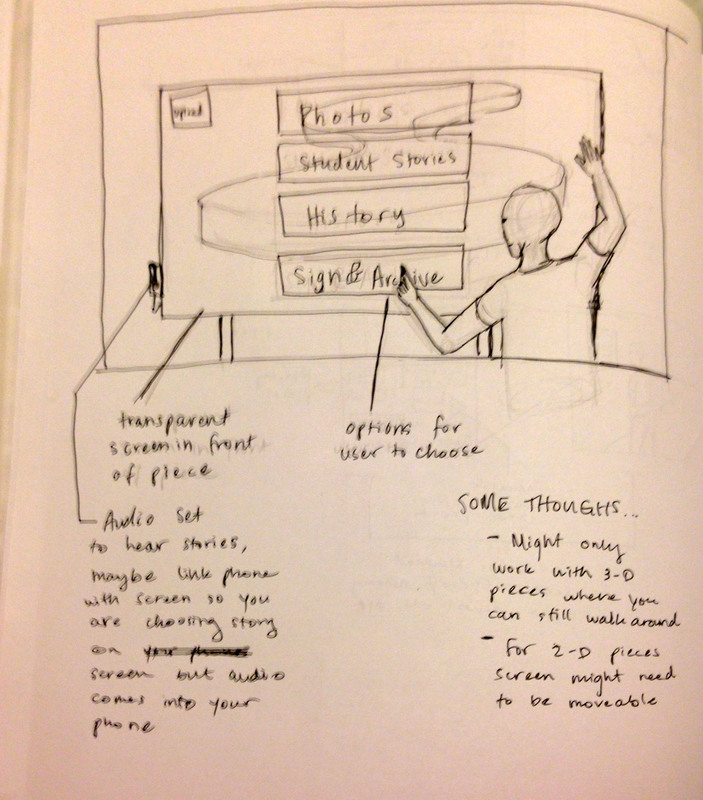 It can allow students to easily draw over whatever areas they want to edit in their work, share it on a large scale, and therefore develop better working solutions. I also wanted to be able to show the relationship between things going on in studio and things going on outside of studio. I think that this is a good solution because this function is not constantly notifying students about who is hooked up to the board. Although I think my idea is a good one to work with, I had some trouble deciding how to lay out my story so that it was clear to understand. I experimented with having multiple slides with the same image but shifting your focus to its different features and I think that it was a good way to explain my thought processes. One thing that I’m not happy with is the quality of my photoshopping skills. I need to find ways for my images to become more believable to the viewer so that they can fully immerse themselves in the world I’m trying to create. I started my process by printing out some different views of the space I created on Sketchup. 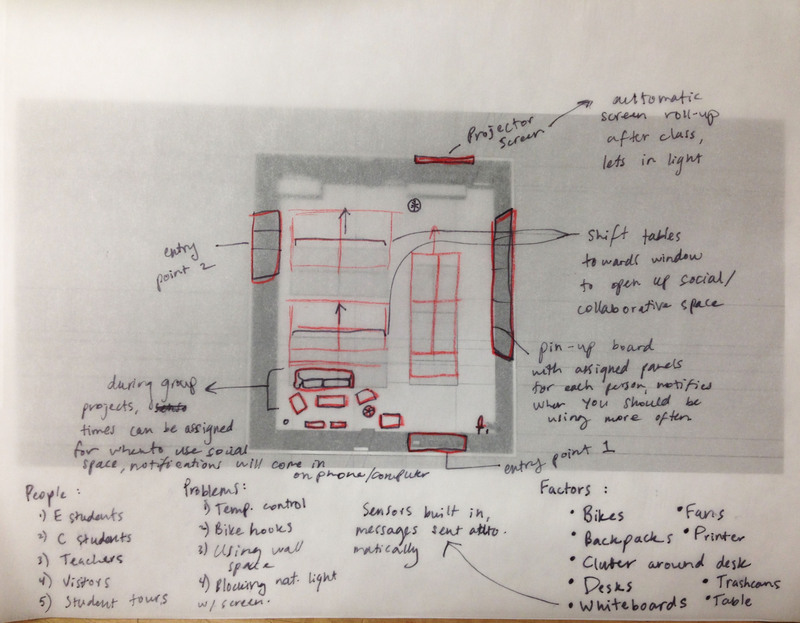 Then I overlaid tracing paper and noted some things about the space. 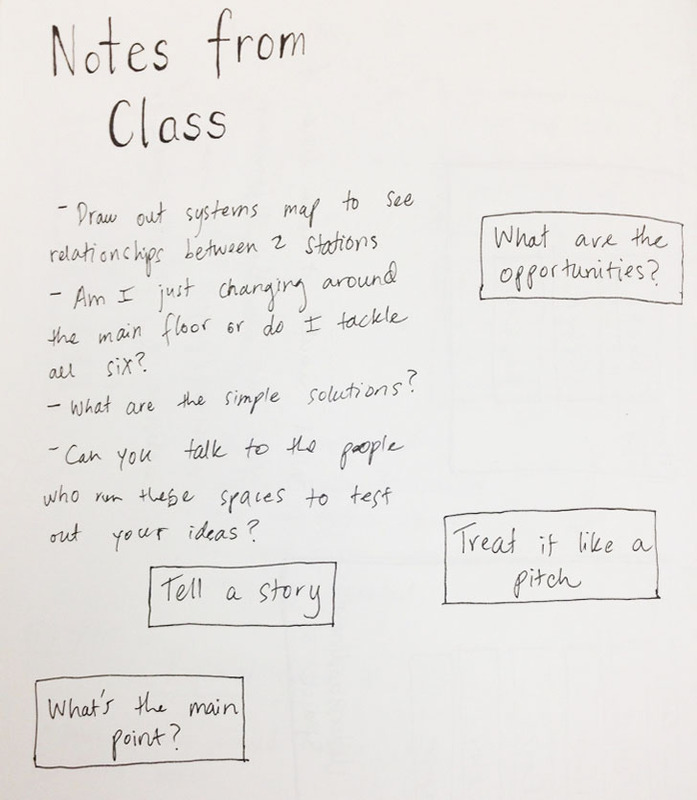 I tried to make note of all the different situations in the room; who would pass through, where certain things are located, if things are in the way of certain paths, how different areas were being used, etc. In this frame I decided to incorporate a collaborative area into the space. I pushed some of the desks back to accommodate this, and considered other possible changes to the space, noting the ample wall space, the projector, and the moving walls. I tried to consider the possible changes of the projector and the sliding walls. From this exploration I started thinking about light, temperature control, traffic flow, and other things. When analyzing a possible social environment for collaborative projects, I thought the incorporation of an interactive wall would be useful. I then started thinking about how to connect these physical items with the Smartthings tool on someone’s phone or computer. I think these explorations were really useful in terms of trying to understand the space and what changes or improvements could be made. I am still unclear as to how these changes could be illustrated in a narrative; I don’t have a clear idea about one single thing I want to make modifications to. I learned a lot about the Sketchup program while making my model and I think this tool will be very useful later. This project was definitely a challenge for me but I learned quite a bit about Illustrator, Photoshop, and InDesign. I think the biggest issues I ran into were deciding what my narrative layout and my key or highlight moments were going to be. I also had some difficulty with finding angles or photos that worked best with whatever I was trying to convey. For example how much of the screen of the phone is reasonable to show compared to the background. 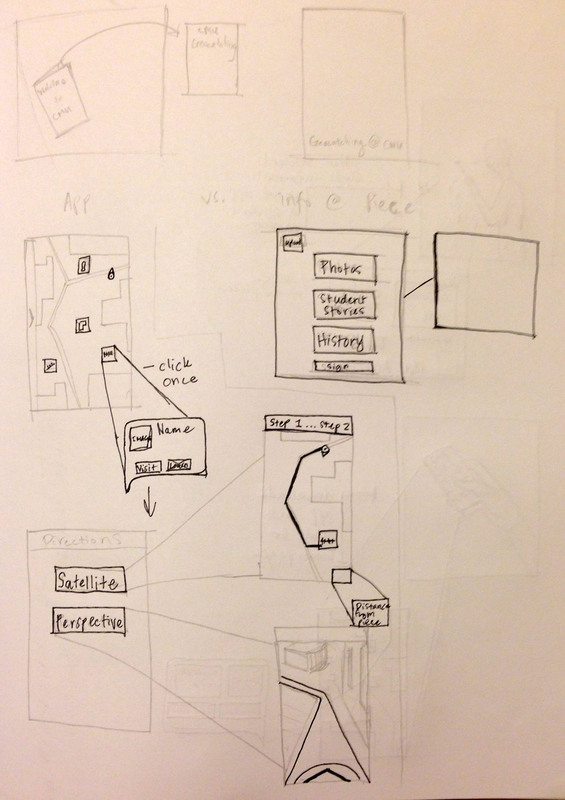 For next time I would definitely play with the layout of the presentation and try and make my app interface a little more complex but understandable. Beginning of my process. Helped me visualize how one should move through the app and if there should be multiple ways of being guided thourgh campus. Once the user arrives at the piece they have the option of interacting with a transparent board. It is positioned so that you can still observe the piece while also exploring the options on the screen. Your phone will be linked to the screen via a bluetooth system so that when you choose to listen to a story or upload a photo or video, the audio/other functions will go directly to your phone.